When you first lay eyes on the XYZprinting da Vinci miniMaker printer, it will appeal to you with its primary colors that make it look like something that belongs in a kindergarten. This product might spark interest in young children but teenagers might not like because of its toy-like design. 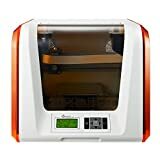 A similar printer to the miniMaker is the Da Vinci Mini that comes in orange. However, you’ll have to fork out an extra $30 for it. The Da Vinci Mini is equipped with Wi-Fi for all you wireless geeks out there. The Da Vinci miniMaker is stable. Its overall dimensions are 15.75 x 13.23 x 14.25 inches. Therefore, you won’t have a problem finding a place to put it. XYZprinting has placed a lot of emphasis on the ease of setup for beginner 3D enthusiasts. This is, perhaps, the easiest 3D printer to set up. You simply have to plug it in the power supply, put the printer head into place and feed some filament to the printer to start printing. No calibration is required for this printer and it will automatically feed the filament too. The included instructions are rather basic. In some way, you’d think that the instructions were a rushed thing that the manufacturer didn’t properly structure and review. However, you’ll get through the setup process and that is the most important thing about the instruction manual. Unfortunately, the Da Vinci miniMaker printer doesn’t understand G-code. Therefore, you have to use the XYZware application. This is a limiting factor for young, curious brains that learn quickly. However, using the XYZware application guarantees that the product will be ready to produce successful builds out the box. XYZware is easy to understand, whether you are a beginner or professional. The only thing it lacks is giving good feedback, making you to sometimes click repeatedly or move forward. You should check the direction your models face when using the XYZware application. Many users have reported their initial objects facing the opposite direction. You can jump to the settings and change the direction easily. It’s perhaps just as fun as seeing the front side of your object and feeling the need to create a time lapse video about it. The Da Vinci miniMaker provide estimates about the filament used and possible time it might take to produce your model. Children can benefit a lot from this because their patience can run out quickly. The XYZware does an excellent job of preparing your object automatically for the printing process. However, it doesn’t provide the option of adding support by yourself. This can lead to a gap in your children’s knowledge about 3D printing in general. Some test models are included in the XYZware. Some of the test pieces include characters from Pokémon. However, Thingiverse has a lot more interesting things to download as test objects. Even though this is an inexpensive printer it will still impress you in terms of the level of detail of the resulting models. For an openly sided printer, it is fairly quiet. You won’t have any problems engaging in an occasional chat when seated next to this printer. However, the printer can be annoying when you place it in your family room making it compete with your television. XYZprinting limits users of the Da Vinci miniMaker to only use their branded filament. The XYZ filaments come in a rather limited color range. This can leave you frustrated because you not only have to pay more for branded filament, but are also limited in color range. It’s easy to understand why a manufacturer might limit its printer to only use its brand filament. By only using their filament, there is little chance that you’ll have problems when using this entry-level printer. The reel has a chip that helps the printer identify the filament type. If you fill up the printer with a different filament, it will simply indicate that no filament is present in its tubes. Even if another brand filament is available in the tubes, it simply won’t print unless its XYZ filament. Some consumers have found a way around using only XYZ branded filament. It will definitely cost you more than few bucks but replacing the circuit board can give you that desired freedom. Keep this limitation in mind if you want to purchase the Da Vinci miniMaker printer. The Da Vinci miniMaker has its positives and negatives. In a nutshell, this is a budget-friendly 3D printer. You won’t have to worry much about refilling the filament every so often as they take some time to finish. Moreover, you’ll be able to print straight out the box without too many hassles. XYZware is fairly simple to understand and learn. However, as your children grow, they might become bored as this software lacks the advanced setting most teenagers would want.